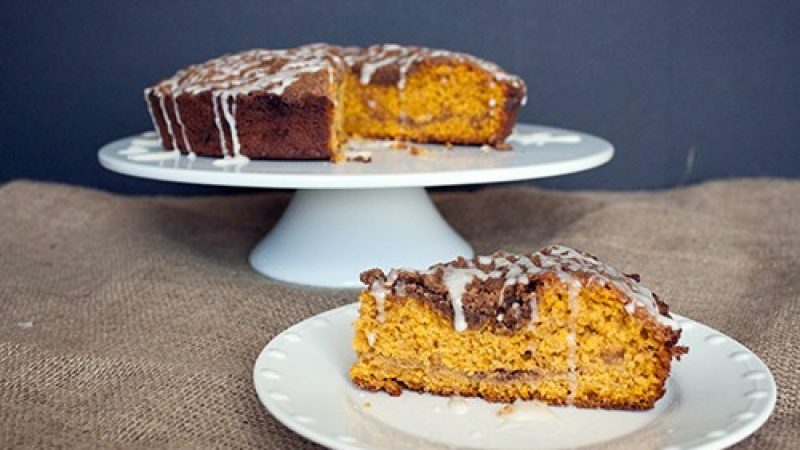 Pumpkin puree, pumpkin spice extract and a homemade streusel topping add to this amazing coffee cake. In a small bowl, combine the flour, brown sugar, ground cinnamon and salt. Add in the pieces of butter, and cut into the flour mixture with a pastry cutter until crumbly. Preheat oven to 350 degrees, butter and flour a 9-inch round baking pan. In the bowl of a stand mixer fitted with the paddle attachment, beat the butter and brown sugar on medium-high speed until it is well combined. On low speed, beat in the eggs, one at a time, scraping the bowl after each addition. Add in the pumpkin puree, Rodelle Pumpkin Spice Extract, and yogurt. Mix on low speed until just combined. Fold in the flour mixture by hand. Evenly spread half of the cake batter in the prepared cake pan. Top with 1/3 of the streusel mixture. Evenly spread the remaining half of the batter over the streusel, then top with the remaining 2/3 streusel mixture. Bake for 50 minutes, or until a toothpick inserted in the center comes out clean. Cool in the pan for 15 minutes, then remove from the pan and cool on a rack. In a small bowl, whisk together the glaze ingredients until smooth. Add a little extra milk if necessary to make the glaze easier to drizzle. And, be sure to try our pumpkin scones, lemony coffee cake muffins, pumpkin cupcakes, and wash it down with our pumpkin spiced horchata!